Below are listed the most amazing natural and man made landmarks of Sierra Leone. Charlotte Falls – Western Area Rural District. Waterfall with many cascades over granite cliff. Cotton Tree in Freetown – Western Area Urban District. 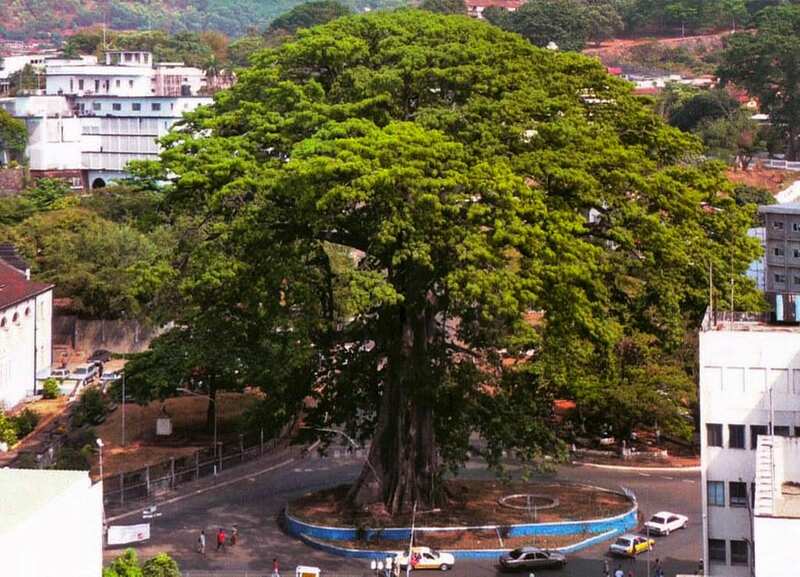 Enormous, beautiful cotton tree (Ceiba pentandra) in the center of Freetown. According to legend in 1792 the first returned slaves from the United States gathered under this tree and held a thanksgiving. 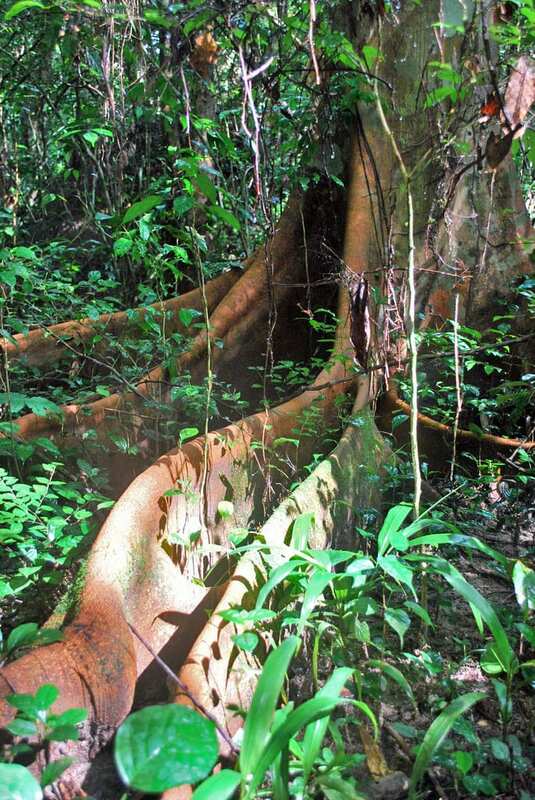 Girth of tree exceeds 12 m.
Tiwai Island – Kenema. Large (12 km²) river island with extremely high biological diversity, many species are found only here. Here live 11 species of primates, more than 40 species of bats, more than 500 species of butterflies. Bunumbu Rock Shelter – Koinadugu. Grotto – shelter with several petroglyphs. Sediments contain remnants of Neolithic settlement. 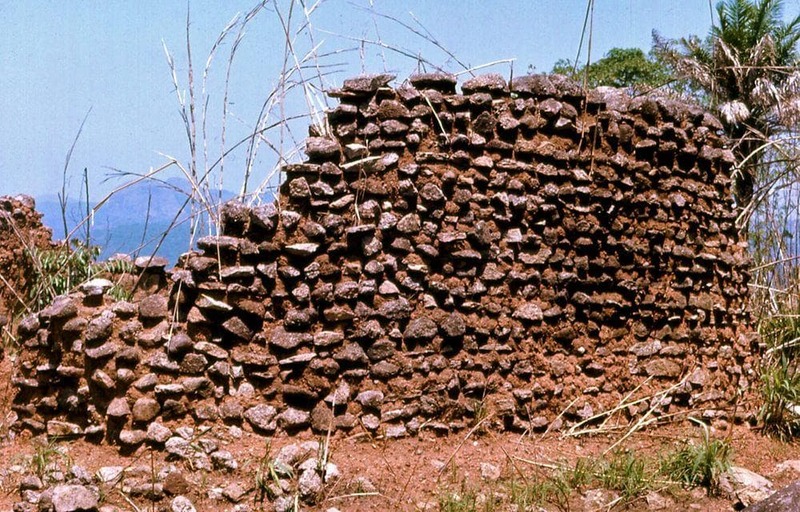 Gola Forest stone settings – Kenema. Group of megaliths – stone circles, upright stones. Kamabai Rock Shelter – Bombali. Grotto with remnants of settlement from the 14th century AD. Here were found somewhat mysterious stone figures (nomoli), probably from the 8th – 10th centuries AD. Kawoya Old Town – Koinadugu. Ruins of the Late Iron Age settlement, which was inhabited since the 13th century AD. 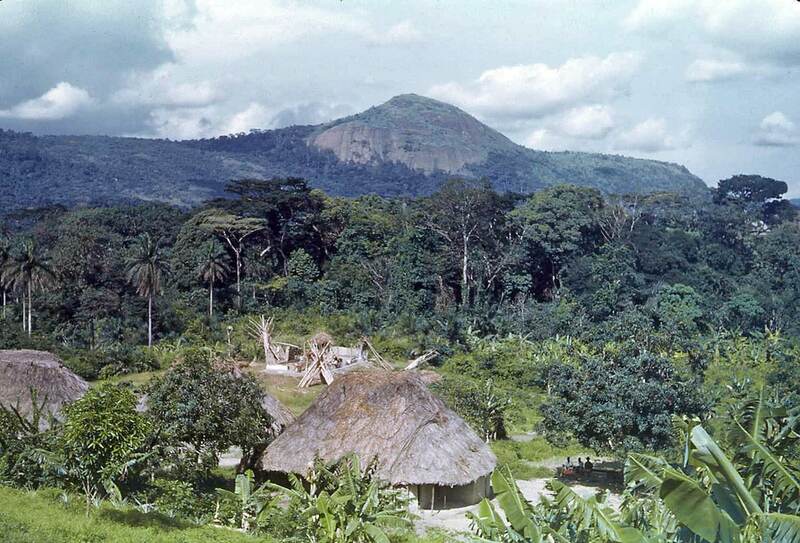 Musaia – Port Loko. Historical Yalunka settlement, which was fortified several centuries ago with entrenchement. Town partly has preserved its original planning with division in clans, interior ring of cotton trees. Yagala Old Town – Koinadugu. Ruins of abandoned mountaintop town. This fortified town was built in the 18th century as a refuge from slave traders and was abandoned in 1952. Includes Wara Wara Rock Shelter, which was inhabited in the first millenium or early second millenium. Yengema Cave – Kono. Grottoe, which has formed in granite. During the excavations here have been found remnants of Neolithic pottery from 2200 – 1500 BC. Bunce Island fortress – Port Loko. European built slave fortress on a small island in the estuary of Sierra Leone River. Fortress was constructed in the late 17th century, now in ruins. Most slaves from Sierra Leone went to South Carolina and Georgia. Fourah Bay College – Western Area Urban District. 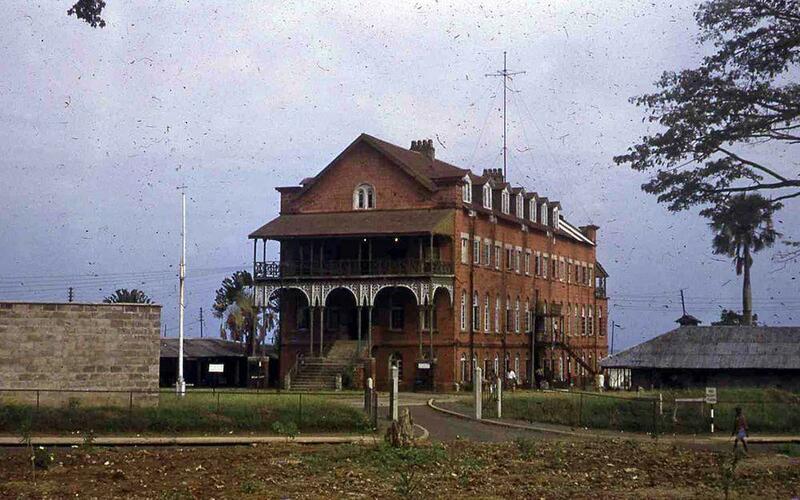 Oldest European styled university building in Sub-Saharan Africa, constructed in 1827. Freetown Martello Tower – Western Area Urban District. Round fortification tower, built to protect the port from the attacks of local people. Now incorporated in Parliament building. St. John’s Maroon Church – Western Area Urban District. Beautiful church in Neo-Gothic style, constructed in 1820. Like most Western African countries, Sierra Leone is not a popular tourist destination and its landmarks are little known. Nevertheless the country is rich with rare and unique species of plants and animals, it has impressive landscape. Surprisingly diverse is the man made heritage. In Sierra Leone are located some prehistoric rock shelters – even with petroglyphs. Here are found also occasional megaliths, fortified and ruined local towns and also some interesting European built landmarks. Cotton Tree in Freetown / postcard, from the Website of Dragan Buškulič, "World on postcards"
In the very center of Freetown, in a roundabout surrounded by a concrete fence stands enormous tree – the famous Cotton Tree of Freetown. Sierra Leone is synonymous with civil war, child soldiers, blood diamonds and most recently the Ebola virus. Few travelers venture here. Yet there is another side to this West African country and Seán goes off in search of it. His backpack is initially lost, he soon becomes entangled in a public lynching and travels into former rebel territory to wild camp in the jungle, home to monkeys and Africa’s deadliest beast, the hippo. This new, thoroughly updated third edition of Bradt’s Sierra Leone remains the only English-language guide dedicated to this unique West African destination, one of only three countries where the über-elusive pygmy hippo can be found and where coastal mountains and sheltered beaches are the stuff of daydreams and postcards. With Bradt’s Sierra Leone you can explore the infamous diamond mines and rainforest-covered mountains; go in search of pygmy hippos or relax on the country’s beaches and islands.